You will earn 273 Reward Points. Earn 1 reward point for every 1 dollar spent. Maximizes Storage Capacity: Top-Track can increase the storage capacity of a given area by 30% to 40%. Cost-Saving Performance: This efficient utilization of space addresses the storage needs of new or growing operations. 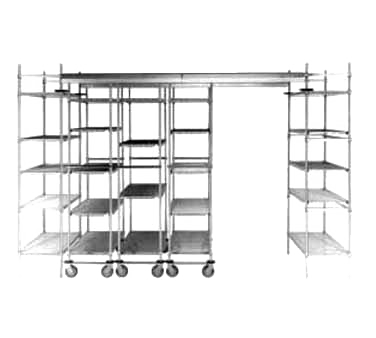 Easy Access: The overhead track system guides the mobile units and opens an access aisle between any two units, whenever it is needed. Increased Productivity: With reduced square footage dedicated to storage, MetroMax Top-Track maximizes the amount of productive “front of the house” space available, increasing daily revenues. Clean Design: Guide tracks are installed overhead enabling easy cleaning of floors. MetroMax i™ and MetroMax Q shelves feature removable polymer mats. *Microban antimicrobial product protection is built into the high contact areas of the shelving systems - shelf mats, frames, and posts - to inhibit the growth of bacteria, mold, mildew, and fungus that cause odors and product degradation. Uniquely Interchangeable: Mix and match MetroMax i™ and Q shelves and posts based on the application. Both shelf options feature removable polymer, open grid shelf mats for longer-life durability and easy cleaning. Corrosion proof MetroMax i™ offers a solid shelf option and better chemical resistance. Corrosion resistant MetroMax Q steel posts can improve the overall rigidity of the Top-Track system in higher weight bearing applications.